Everyone will enjoy the combination of spinach and artichokes in this classic dip -- but without the guilt -- since it's made with creamy lowfat yogurt. 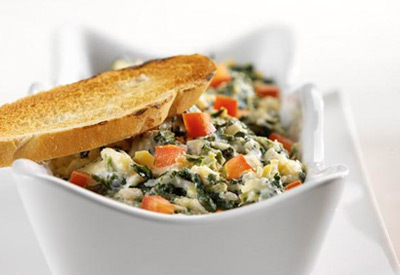 Combine artichokes, spinach, yogurt, cheese, onion and garlic in medium bowl and mix well. Pour mixture into 1- quart casserole dish or 9- inch pie plate. Bake for 20 to 25 minutes or until heated through. Sprinkle with red peppers and serve immediately.